The fiftieth anniversary of many major milestones in what is commonly called the African-American Civil Rights Movement was celebrated in 2013. Fifty years removed from the Birmingham campaign, the assassination of Medgar Evers, and the March on Washington and it is clear that the sacrifices borne by those generations in that decade were not in vain. Monuments, museums, and exhibitions across the world honor the men and women of the Movement and testify to their immeasurable role in redefining the United States. 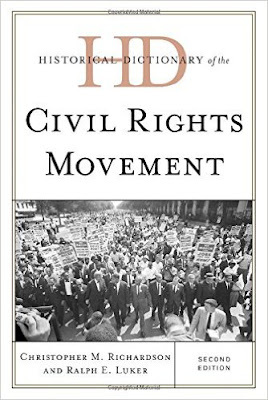 The second edition of Historical Dictionary of the Civil Rights Movement is a guide to the history of the African-American struggle for equal rights in the United States. The history of this period is covered in a detailed chronology, an introductory essay, and an extensive bibliography. The dictionary section has over 500 cross-referenced entries on important personalities, significant legal cases, local struggles, forgotten heroes, and prominent women in the Movement. This book is an excellent access point for students, researchers, and anyone wanting to know more about the Civil Rights Movement.